After gathering sufficient provisions for the week at Morrisons, the crew left Alan's house eagerly awaiting the start of their latest dangerous mission. 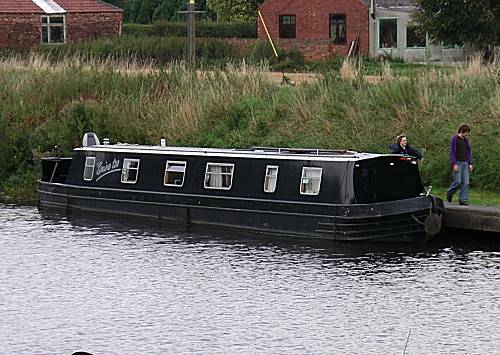 With the help of Colin the boatyard at Selby was quickly located and their belongings rapidly transferred to the boat. The Stealth Narrowboat was found to be in excellent condition and the crew rapidly prepared a healthy lunch of salad with a little pork pie. After filling with water and 158Lts of diesel they set off towards the feared and flooded River Aire. Due to the intense media interest in the crew's dangerous mission, Alan was contacted by local radio for a live interview of their progress to date. Alan made little of the immense pressures bearing on the crew. 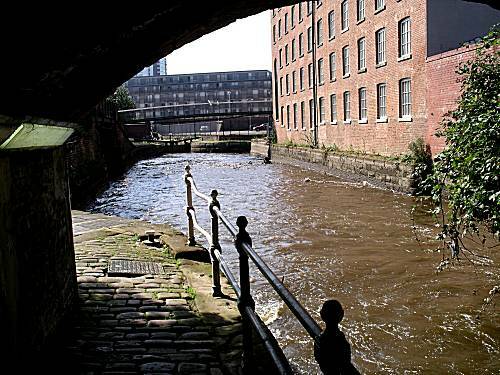 Neil gazed in awe at the fast running River Aire, but they remained confident of their ability to handle the difficult conditions. The crew hurried to investigate the village and accurately located the George and Dragon where ale and Gammon dinners settled their nerves. After dinner the crew walked to the nearby village of Chapel Haddlesey where further ale was consumed before returning to the boat for coffee with small portions of cheese and biscuits. 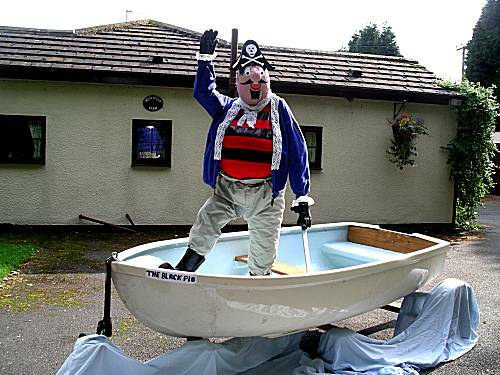 Because of the high likelihood of delays to their progress on the difficult canals ahead of them, the crew were anxious to push ahead of their planned destination for Sunday of Methley Bridge. 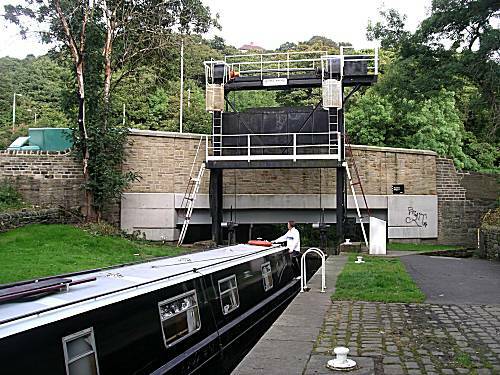 They realised that immense effort would be required to achieve this and they retired to the bunks knowing that only one giant lock lay between them and the feared River Aire. The crew managed a restful night, despite the unbearable pressures on them and rose at 7-50 for Neil to prepare flooded river preventative porridge. 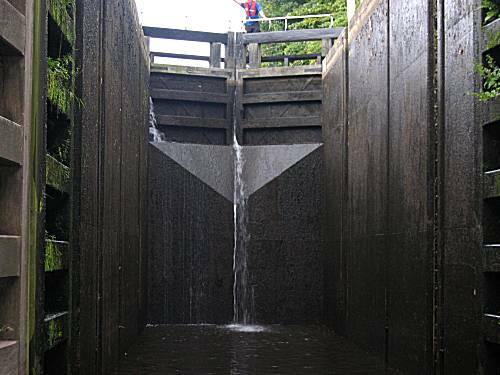 With great intrepidation, the giant gates of the flood lock were opened exposing the narrowboat to the full force of the flooded River Aire. A nearby boater kindly agreed to close the gates behind them knowing that once the narrowboat hit the full force of the water there would be no chance on getting back on board. Neil was greatly troubled by the fast flowing waters in the river, knowing that stopping for a cooked breakfast would require great skill and courage. 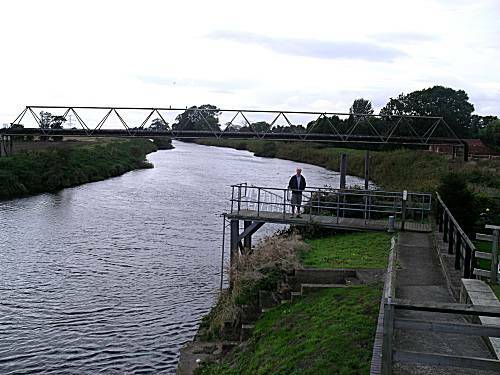 The crew were alarmed to see the normally open flood lock at Ferrybridge closed and a red signal showing. However, Alan was quick to radio through to the lock keeper on Channel 74, to explain the importance of their mission. The lockeeper's re-assuring voice comforted the troubled crew greatly and quickly opened the gates to provide short period of haven for the crew. 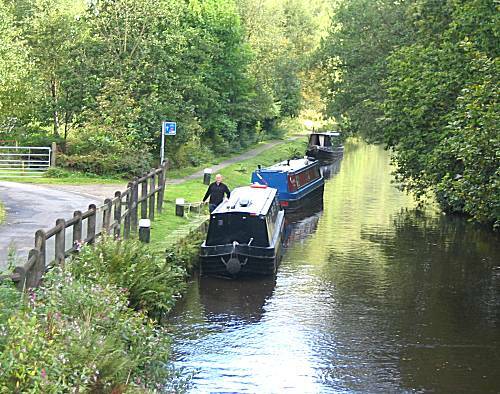 After the stress of passing through the giant electrically operated Bulholme Lock the crew quickly moored, on the only available "Commercial traffic only" wharf, to prepare a nerve calming breakfast of sausage, bacon, egg, with some beans, but no mushrooms. No rest was allowed after breakfast as the crew had to pass the enormous Castleford Flood Lock before Neil made an excellently executed difficult turn, against the fierce current, into the Aire and Calder river, towards Wakefield. 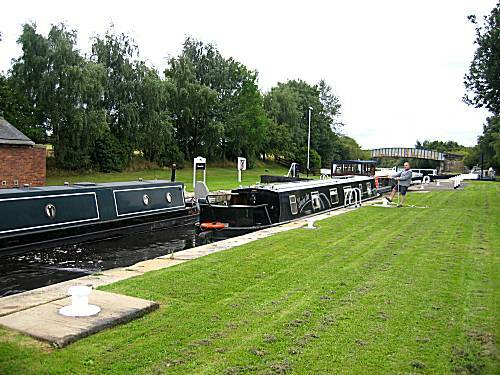 The Aire and Calder Navigation to Wakefield proved interesting with numerous giants automated locks shared with a number of other craft with inexperienced crews. 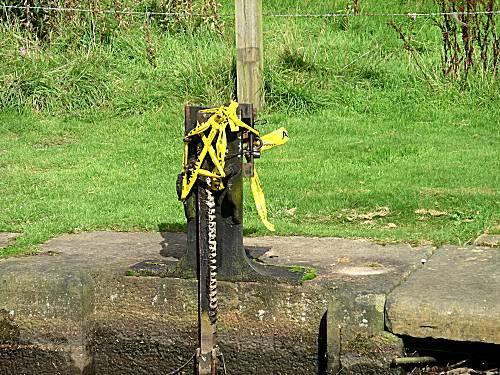 The crew were disappointed to find themselves being lectured by one narrowboater's wife on the operation of the canals locking systems, when their obvious experience should have been apparent. 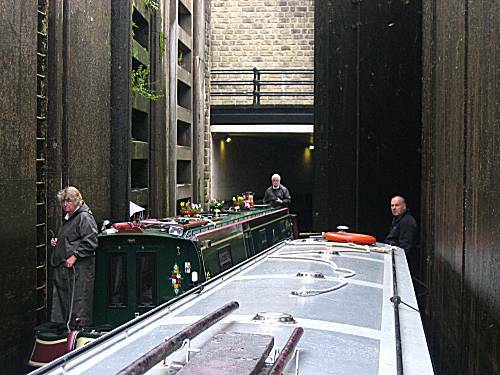 The crew narrowly avoided crippling delays due to their exceptional skills, whilst sharing locks with other narrowboats with inexperienced crews. The narrowboat forged on in the difficult conditions to arrive, well ahead of the torturous schedule, at Horbury, where after refreshing showers they hurried to the Navigation Inn to partake in nourishing dinners of chicken curry with poppadoms and extra Mango Chutney. The crew were pleased to find Timothy Taylors Landlord ale on offer, at a mere £2-99 per pint, which met with guarded approval. The crew returned at an early hour to the boat for coffee with modest portions of cheese and biscuits, whilst they considered their options for an overnight mooring the following evening. 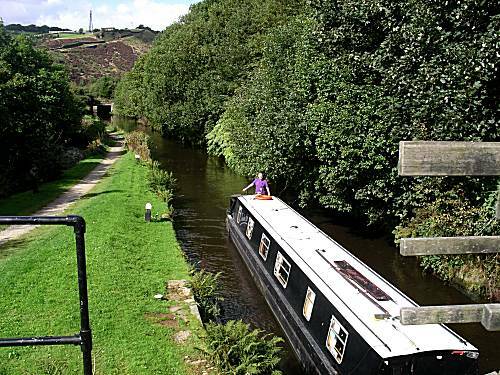 They felt that their superior skills could allow the narrowboat to reach Sowerby Bridge, as long as no disasters hinder their incredible progress. The crew were comforted by the thought that they had completed the first of the difficult tasks that they had set themselves, but knew that worse was ahead of them and retired to their beds comforted that no disasters had yet occurred. The crew slept well, but rose at an early hour knowing the extreme workload that lay ahead of them. 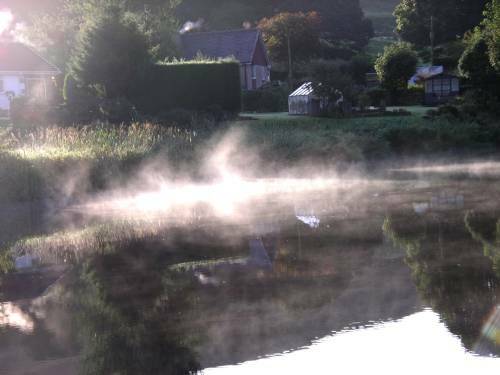 Neil's powerful porridge enabled them to cast off just after 8am on their onward journey through the unknown territories of the Hebble and Calder Canal. 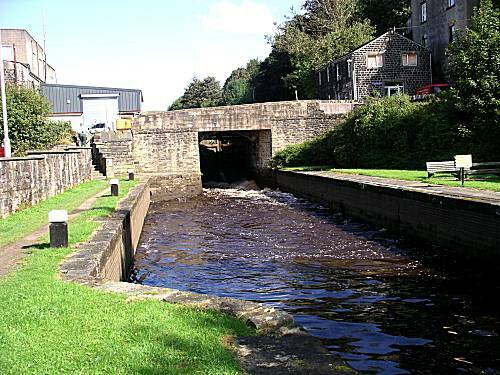 Much to their surprise, the canal stopped at regular intervals while they joined the strong currents of the very wide and feared River Calder. The crew remained calm as they passed numerous flood locks indicating dangerously strong river flows ahead. Neil was in awe of the noisy M62 as they passed beneath the giant flyover. 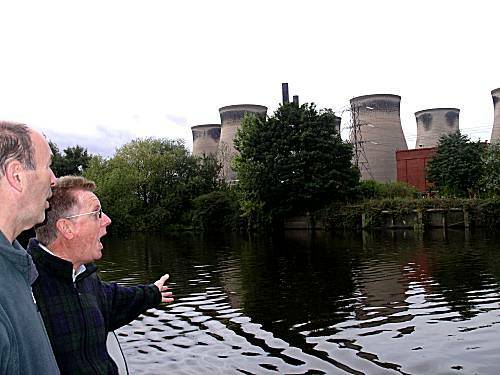 Alan remained calm as the narrowboat again hit more difficult waters of the wide River Calder with its enormous weirs. 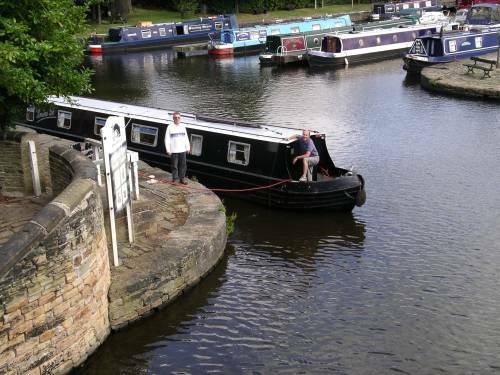 After further impossible conditions the narrowboat eventually arrived into the canal basin at Brighouse. Here they were able to replenish their stocks of milk, bread and pork pie, as well as refilling the dangerously low fresh water supplies on board. The crew felt that with the incredible progress they had achieved to date, that it might be possible to reach Sowerby Bridge for the evening. 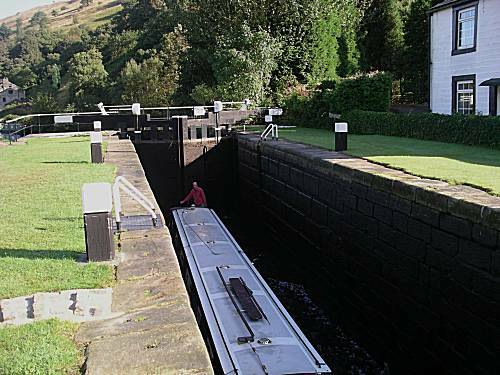 Neil had contacted British Waterways earlier in the day, who advised them, that in recognition of the crew's superb progress, they would consider allowing them to tackle the final ascent of the locks of the Rochdale Canal one day earlier than previously booked. The crew were humbled by this news. Further evidence of the historic nature of the route was noted by passing numerous old mill buildings. With extreme effort after the trauma of the guillotine lock, the narrowboat gently drew into Sowerby Bridge at the late hour of 6:20pm. 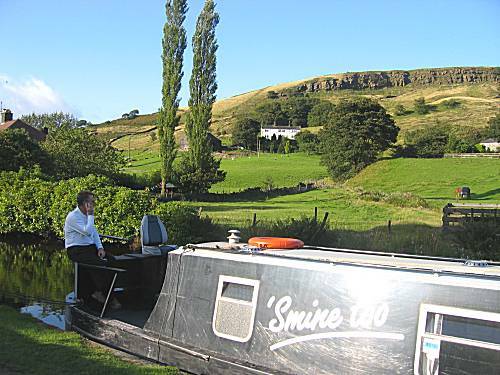 The narrowboat now left the relative safety of the Calder and Hebble Canal into the wild and unknown Rochdale Canal ascending to the very summit of the Pennines. Cunningly the crew found a position close to Lock No 1, where they quickly moored and consulted the locals as to the best eating and drinking establishments. After showers (except Ron), the brave mariners headed off to investigate Tuel Lock, which is by far the deepest and most dangerous lock on the whole of the UK canal system. 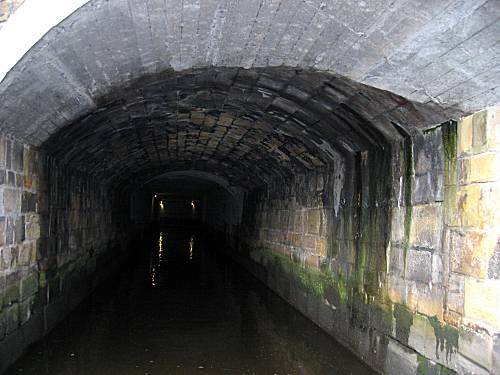 It was apparent that the lock would have to be accessed via a long and deep tunnel under the very heart of Sowerby Bridge. 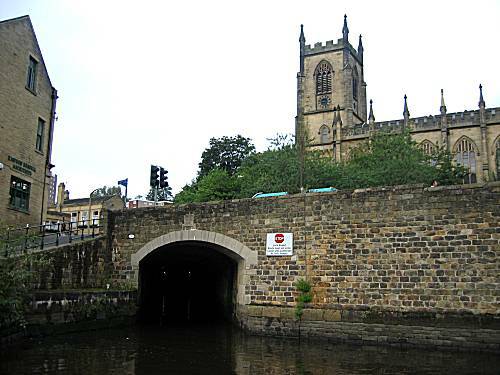 The relatively newly constructed lock has a rise of 20feet 8½ inches and is located in an underground cavern beneath the town. The crew were horrified to realise that this would have to be accomplished at 8am in the morning with only a little porridge to sustain them. The crew tried to put this to the back of their minds and hurried to the recommended pub called "The Works". Although offering a good selection of real ales, the food menu proved disappointing and they rapidly moved on to find a more traditional canalside pub called "The Navigation". Here they feasted upon Fish Pie, New York Chicken and Beefburger dinners with a number of pints of Timothy Taylors Landlord ale. 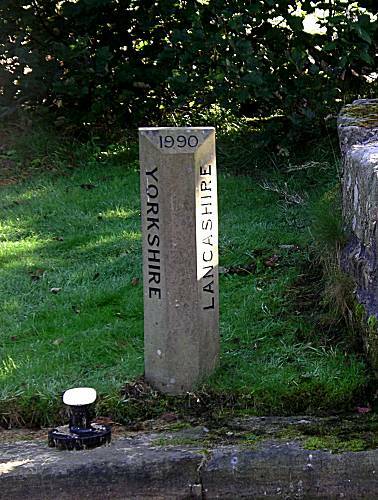 Neil cunningly found a shortcut back to the boat where they studied their maps in great detail to establish whether they should confirm their passage over the top of the Pennines one day earlier than planned. They decided unanimously to delay the final decision until after the trauma of completing Tuel Lock the following morning. The crew tried to hide their fear by nibbling small portions of cheese and biscuits, but retired to their bunks unable to sleep knowing the feared Tuel Lock lay ahead of them. 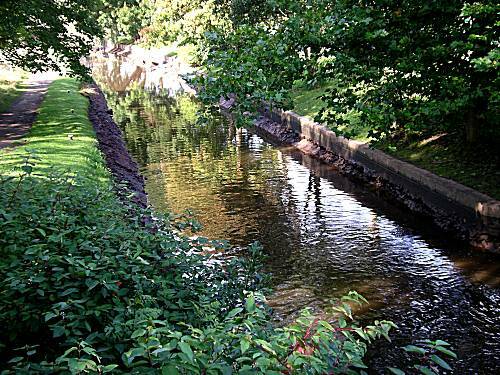 The crew awoke early in a quiet mood, with the fear of Tuel Lock bearing heavily on their minds. Neil prepared pacifying porridge which was consumed in small mouthfuls. 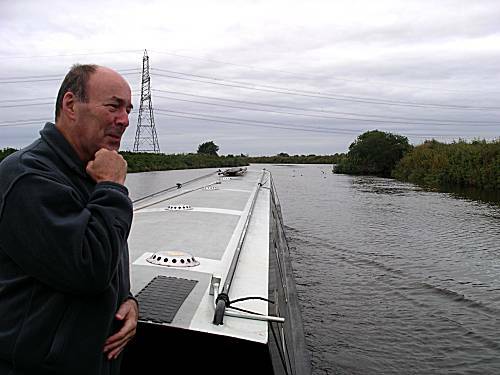 Neil walked on to consult with the lockkeeper, who immediately recognising their considerable skills, quickly confirmed that they should be the first boat through the fearful lock. 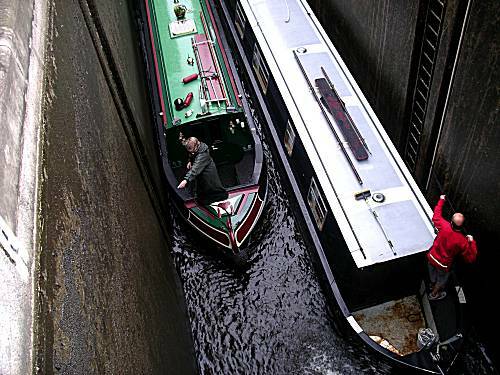 In order to provide training for other narrowboaters with less experienced crews, the lockkeeper suggested that a another boat should accompany the crew on their daring transition of the lock. Ron stayed on shore, so as to alert the authorities in case of disaster, looking down in trepidation at his fellow crew deep beneath him. Much to the obvious relief of the crew, the narrowboat was carefully lifted to ground level again and they were able to continue their epic journey, with minimum stress. 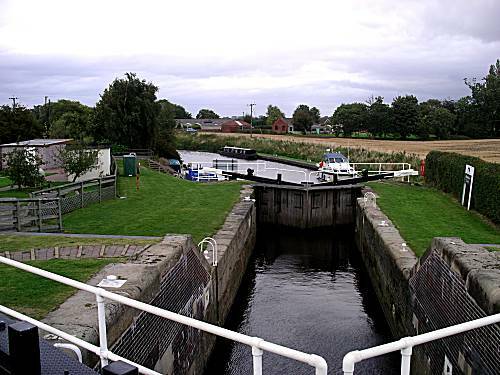 The narrowboat persevered onward through difficult damp conditions and they decided not to proceed at all haste to the final ascent starting point at Lock 33. 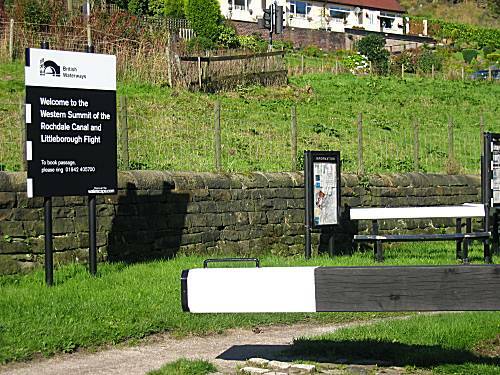 Instead they opted to moor at Hebden Bridge, in order to absorb the maximum amount of culture possible. On arrival, instead of preparing a very late fried breakfast, the crew hurried into the town and purchased a healthy fish dinner, consumed in the local gardens overlooking the canal. 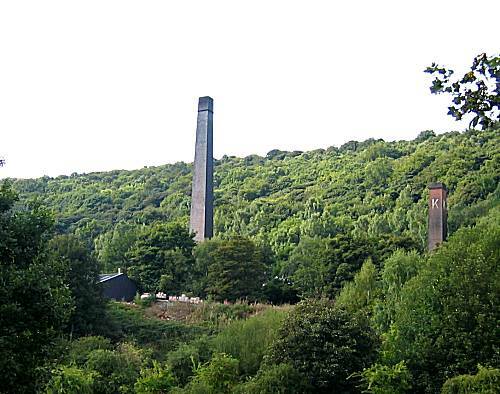 In order to use their spare time at Hebden Bridge in a responsible manner, mind promoting visits were made to alternative energy "green" museums and the crew viewed many crafty workshops where numerous useful items were being manufactured. The crew had initially selected the "Stubbing Wharf" for their evening entertainment and despatched Neil and Alan to investigate. They were quick to test the Timothy Taylors ale on offer, but Alan was distraught to find himself being stung by a wasp, whilst consuming his ale. He received little pity from the other crew and therefore fought back any tears!! Whilst Neil was investigating the town he quickly found "The Hole in the Wall" public house, serving Black Sheep Ale, together with live music. However, he also cunningly located an alternative eating establishment, being a Thai restaurant, offering a three course earlybird dinner at a mere £9-95, which the crew hurried to sample. Thai curries, red, green and mild were enjoyed along with Tiger Ales. The crew awoke with heavy hearts knowing that they have yet another hard day ahead of them to reach the base camp, prior to the final ascent of the Pennines. Even Neil's pure porridge was unable to lift the crew's spirit's sufficiently to tackle the day's exertions. 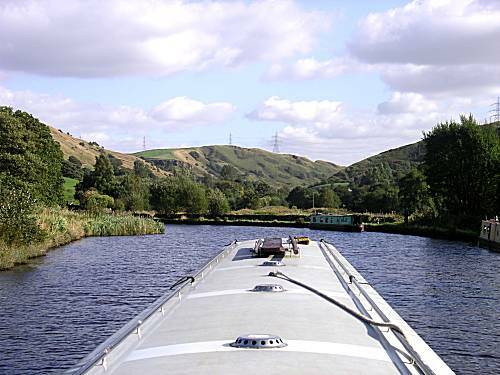 An initial visit was made to the British Waterways services, where quantities of fresh water were taken on board, as the crew knew that further supplies before Manchester were unlikely. The first three locks were shared with a couple in an immaculate green boat, as the captain of this boat shared his story of life in various power stations and years in Maidstone. Thereafter the crew, fearful of the considerable effort that would be required to reach base camp for the night, fell into their well oiled locking routine. Progress was again delayed when a hire craft, with inexperienced crew, caused the narrowboat to swerve, almost hitting the bank. 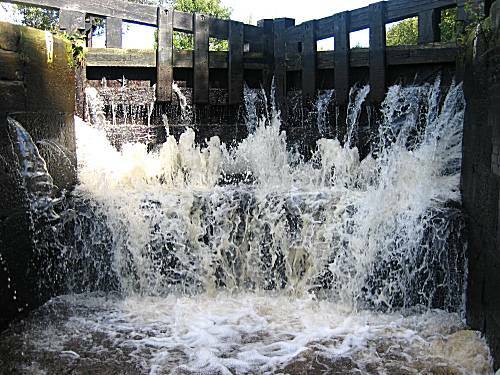 FURTHER DISASTER AVERTED - The crew were horrified to encounter a narrowboat ahead to them, who for unexplainable reasons chose to lift the water level prior to the lock, by opening both lock sluice gates and passing incredible amounts of water downstream. 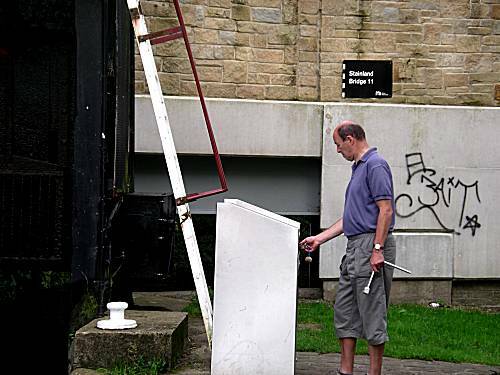 The crew knew that this would lower the water level in the pound above the lock to dangerously low levels. 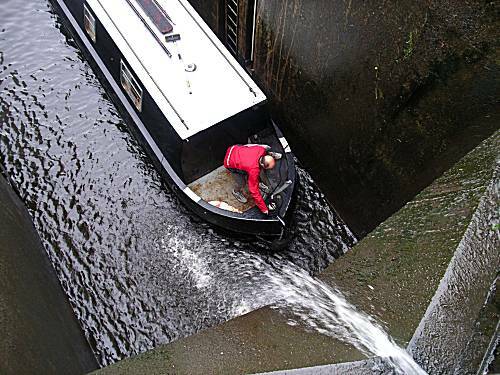 Only after immense skill was demonstrated, did the crew manage to get their narrowboat successfully into the next lock, leaving the crew of the offending boat in complete shame. 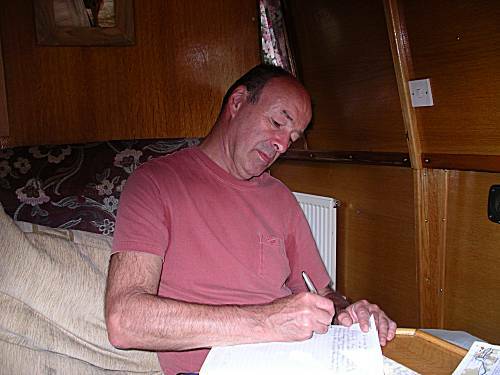 Alan battles with the tiller in the shallow waters, created by the narrowboat with incredibly inexperienced crew. Returning to the boat the crew shared their last remaining cheese and biscuits ready for the final ascent of the Pennines the following morning. 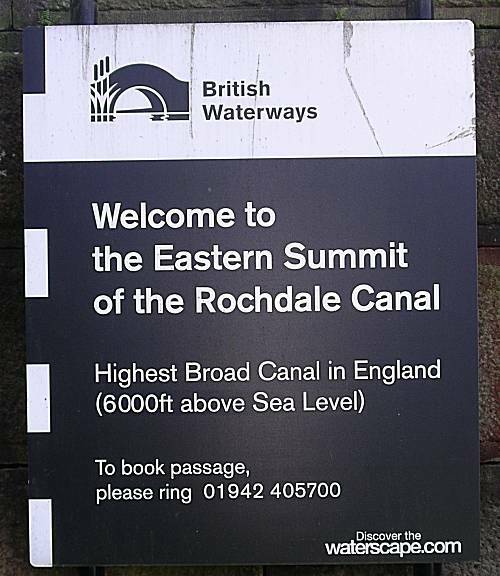 They tried to sleep knowing that the British Waterways inspector would be attending at 9am the following morning to authorise their attempt to reach the summit. The crew passed a restless and difficult night on board and were up early in eager anticipation of the attempt of the final ascent to the Summit in the morning. 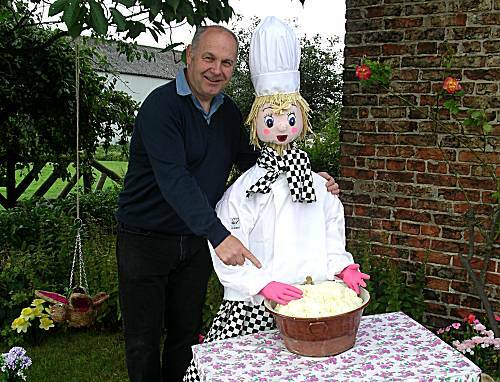 Pre-summit porridge was prepared and carefully consumed, whilst the crew awaited the arrival of the British Waterways inspector. 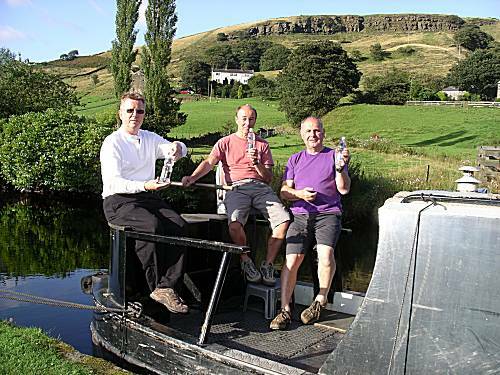 The British Waterways inspector arrived spot on time and immediately recognised the crew as instinctively having the required skills to attempt the final ascent. He warned the crew of dangerously low water levels ahead, making sections to the top totally impassable, but the skilled crew dismissed these knowing that their ingenuity would win through. He authorised their ascent, secretly aware that he would be able to gain some extra knowledge from the skilled crew. 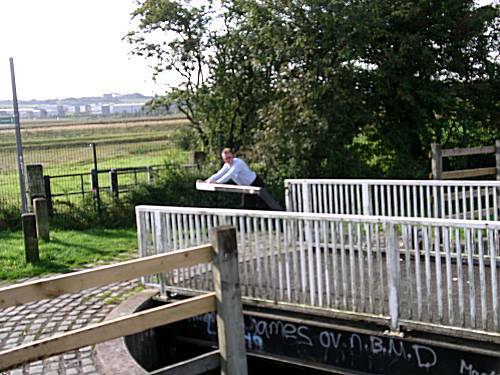 The crew were overwhelmed with happiness to see the sign indicating their successful ascent, only rarely undertaken by a narrowboat of this size. They were staggered to see that the canal had reached over 6000 ft above sea level, which they realised was nearly twice the height of Snowdon !!! The crew's luck ran out at lock 41 when the water dropped to un-navigable levels. The crew were quick to devise a cunning plan and put it into action whilst they enjoyed a coffee with one hob-nob (milk chocolate variety). For some time the canal wound its way across Chelburn Moor, but the crew knew that they would soon reach the start of the dangerous descent. A water point was located, allegedly the last before Manchester, and the crew took full advantage of the facilities. The narrowboat was quickly moored in the town just before Lock 48, where the crew prepared a healthy pork pie lunch with salad and cup-a-soups. A party was despatched to investigate any possible eating and drinking places in the town. Their return is awaited. The landing party eventually returned with stories of dull pubs, chinese restaurants and giant lakes. After the statutory resting period, compulsory after periods of high workload, the crew set off to investigate the area fully. Hollingsworth Lake, just over a mile away, had a holiday feel to it, and the crew watched rowing teams practicing on the calm waters. Numerous bikers arrived on their powerful machines, as the crew sat and drank their pints of Copper Dragon bitter, sitting outside in the evening sunshine. Afterwards the crew took the quicker road route back to the Littleborough town centre, where, after taking a shortcut through the railway station, they made their way to the Chinese Restaurant, where a banquet of chinese food was enjoyed, without duck, but accompanied by Tiger Beers. The crew felt need afterwards for one swift pint of Thwaites Bomber ale in the clean, but working mens pub opposite, called The Queens. The crew were amazed to find the fine ale on offer at only £2-15 per pint, the cheapest yet of the entire expedition. 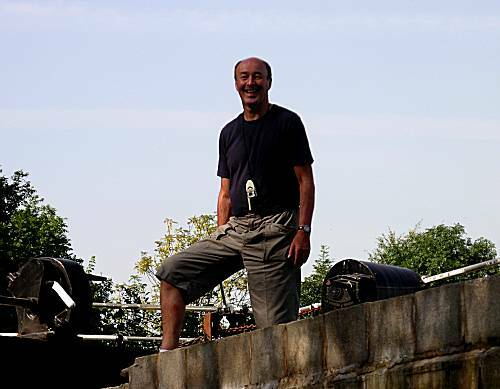 The crew returned to the narrowboat, where Alan reminded them that only one day of relaxing cruising remains before the crew had to tackle the dreaded final lock descent into Manchester starting at Lock 65, under the close supervision of the British Waterways team of engineers. The thought of this sobered the crew and they retired to their bunks without even considering cheese or biscuits. The crew awoke in a good mood anticipating another fine day of cruising. But even Neil's positive porridge was not going to prepare them for the difficult conditions that they were to encounter in Rochdale. 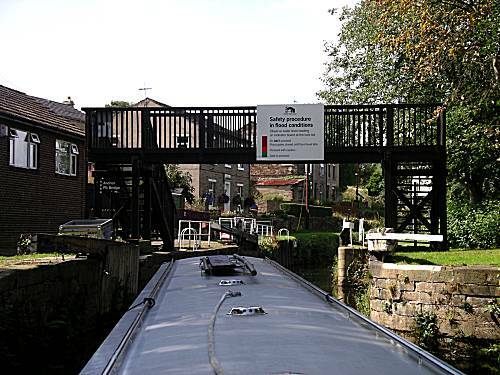 Initially the canal took the narrowboat through some idyllic countryside, before they encountered a series of obstacles - Two Hand Operated Swing Bridges. 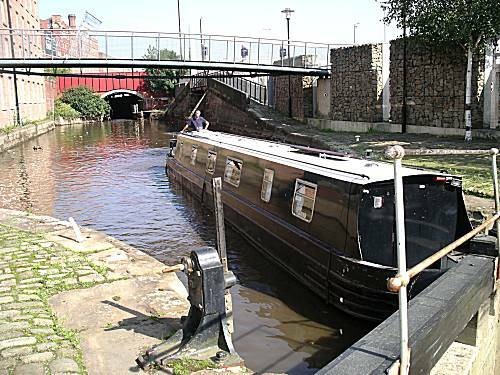 The canal through Rochdale proved very dirty with much floating rubbish, but the crew were able to handle these difficult conditions with minimum stress. The crew watched with interest when fisherman ahead landed a giant Pike to his obvious pleasure. The Slattocks flight of locks, were found to be in good mechanical order and the crew were quickly able to get into their masterful locking routine, making the descent in a record time, much to the amazement of the local inhabitants, who flocked to view their progress. After the stress of the locks, the crew cunningly moored inside lock 63 to prepare lunch, knowing that this section of the canal had been reserved for their dedicated use. After lunch a landing party was again despatched to investigate the "Rose of Lancaster" drinking and eating establishment in nearby Chadderton. They returned to advise of good menus and a fine selection of J W Lees of Oldham real ales. The crew took time to relax, anticipating an evening of food and drink. 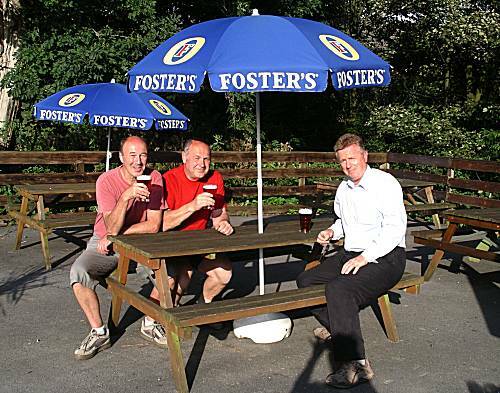 The compassionate crew, eager to help, quickly arranged for heavy lifting gear and a low loader to be sent to site, whilst they visited the nearby "Church Inn" for some JW Lees Bitter, which met with their approval. 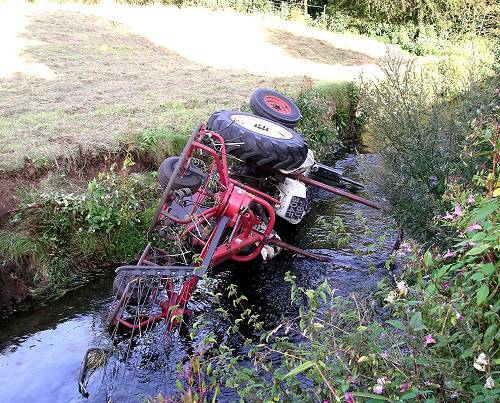 On returning to the boat, it was noted that their planned tractor rescue had been successfully actioned. The crew cunningly visited the Rose of Lancaster for their evening entertainment, sampling more JW Lees fine bitter and consuming fish & chip dinners, except Ron, in the patio area overlooking the canal. 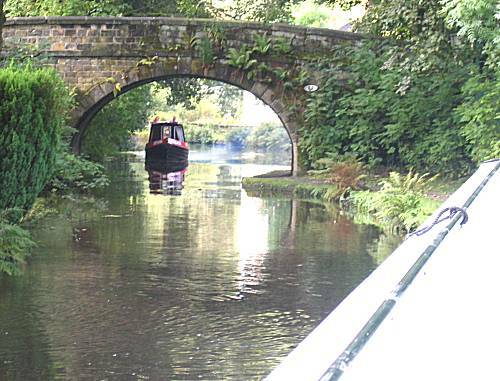 Later on, returning to the boat, carefully avoiding many toads, the crew quickly remember the treacherous final section of the supervised Rochdale canal that had to be completed the following morning at 8-30am and managed only small portions of cheese and biscuits. The crew set their alarms clocks early to rise before 7am for Neil's fear preventing porridge. 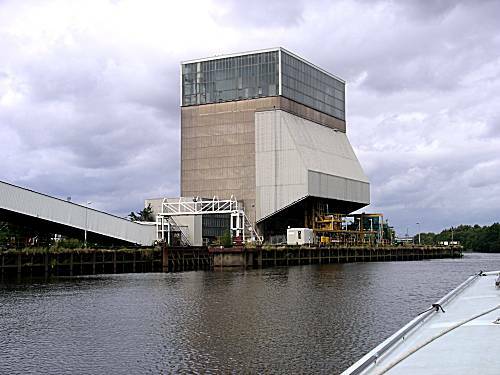 They set off at 7-30am, quickly and proficiently operating the giant hydraulically operated Grimshaw Lane lift bridge. 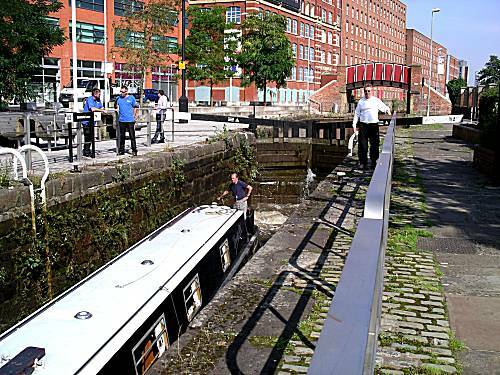 They were anxious to rendezvous with the British Waterways inspectors at Lock 65, who would again authorise their passage down the most difficult and dangerous section of the Rochdale Canal yet. 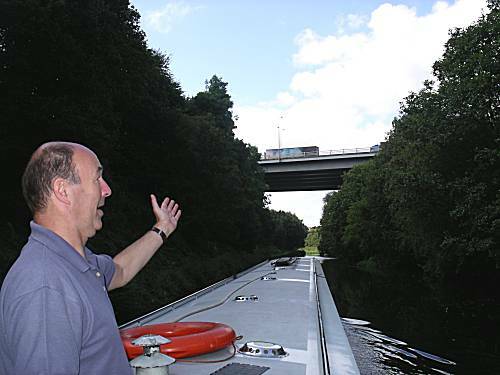 The BW engineers, realising the advanced navigational skills of the crew handed over their keys to the entire section, fully trusting the crew to handle the canal successfully. 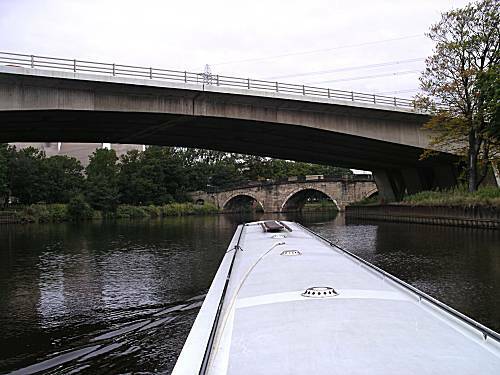 They advised that no other crew were bold enough to attempt the transition of the canal this day and that the entire section to Manchester would be under their exclusive control. The crew quickly discovered that the canal was so shallow, that it was impossible to pick up or drop off crew members at the canalside. 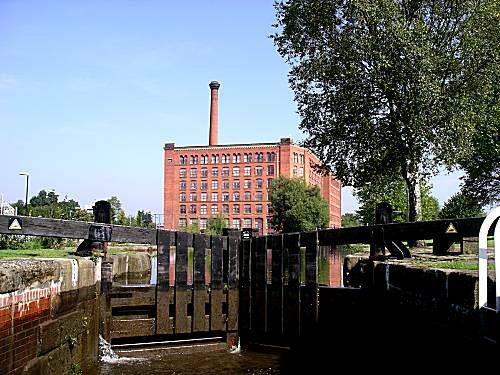 They therefore decided that everyone, except the helmsman, must stay on shore operating the locks and walk the entire length of the canal to central Manchester. This caused the crew no concern as they were well used to such high endurance situations. 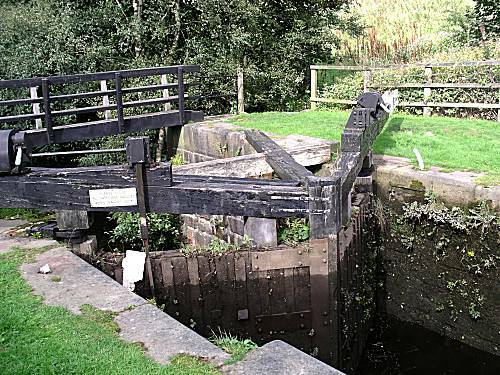 The crew were alarmed to find that the canal section below lock 80 was at an impassable level. But checking that the gates of the lock below were secure, they moored in the lock, as the skilled crew flushed water through from the pound above, whilst they enjoyed coffee, with extra Hob Nobs. 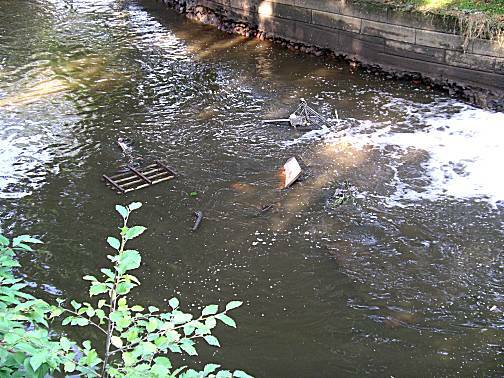 Much debris was seen in the canal, but the crew knew how to handle these situations without damage to the craft. Neil attempted to hide his fear and keep the moral of the other crew high by cracking jokes, but the remainder of the crew recognised his deep seated concerns and tried to ignore him. The narrowboat passed Newton Heath, where much social housing was seen boarded up and burnt out, together with many individuals seen drinking Stella Artois from cans by the canal bank. As the day unfolded it seemed that the crew might never reach the safety of Manchester, but they attempted to keep their spirits high. 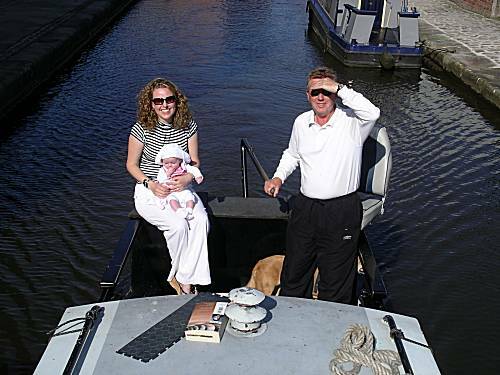 As the narrowboat continued on it's dangerous journey, the crew were pleased to see the British Waterways engineers return with their families. Word had travelled through the BW ranks of the incredible boatmanship being displayed by the crew and that they could safely allow their loved ones, including their 2 year old granddaughter to travel on-board, without fear of any stress. 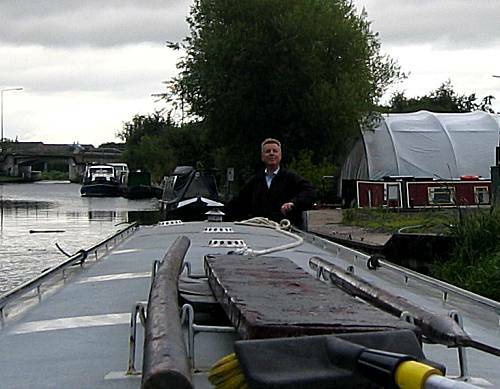 The BW staff followed every move of the narrowboat, as they neared Manchester, hoping to learn more from the crew about how to handle such craft in the desperately low water conditions. 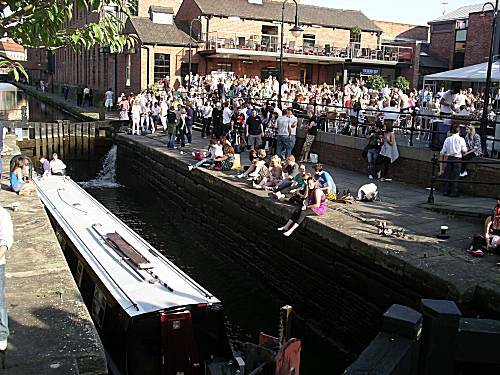 After filling with water the narrowboat was moored in Castlefields, whilst the crew prepared for an evening of entertainment and merriment. The crew cunningly located 'The Knott' real ale house, where much ale and burger dinners were enjoyed during the evening. 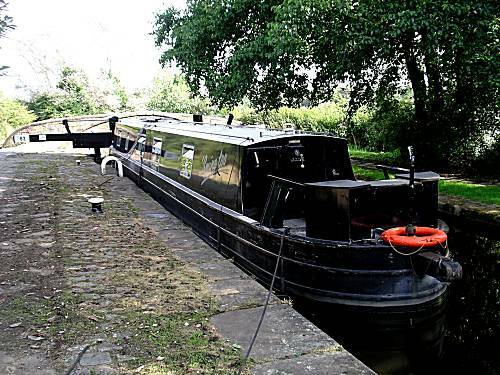 The jubilant crew returned to the narrowboat in high spirits knowing that no further locks or obstacles, other than the formidable Barton Swing bridge, crossing the Manchester Ship canal, remained between them and a successful mission. After the exertions of the previous day the crew slept in till after 8am, before getting ready for their final day with Neil's preparatory porridge. 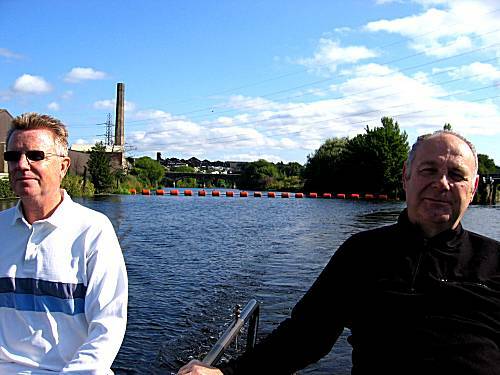 They set off in trepidation, making the difficult turn onto the Bridgewater canal heading west out of Manchester. Soon they were overlooking the Salford Quays area of the Manchester Ship Canal, but realised that only too soon they would have to make the awkward turn, at Waters Meeting, towards the formidable Barton Swing Bridge. 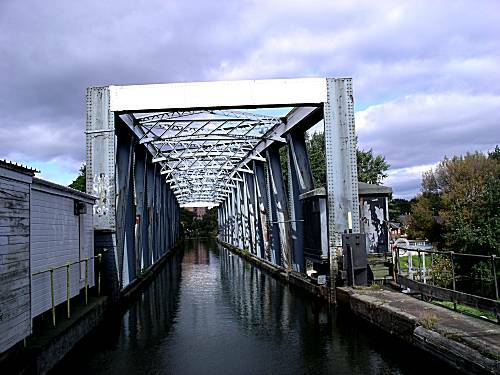 The giant steel Barton Swing Bridge opened in 1893, creaked and groaned, as the 20 ton Stealth narrowboat slowly made it's way across its fragile structure, but the brave crew showed no signs of distress. After the trauma of the Swing Bridge subsided, the crew settled down to the home straight towards the Bridgewater Marina, now only a few miles ahead of them. They were in high spirits as they skilfully pulled into the fuelling jetty where they were welcomed by the Marina Staff in a heroes manner. After filling with 58 Lts of diesel, water and pump outs the office staff asked for their autographs, but Alan merely filled in his name and address in the shops fuelling book, declining any other forms of publicity. After a successful conclusion to their dangerous mission, the brave crew award themselves Magnum's (ultimate variety). 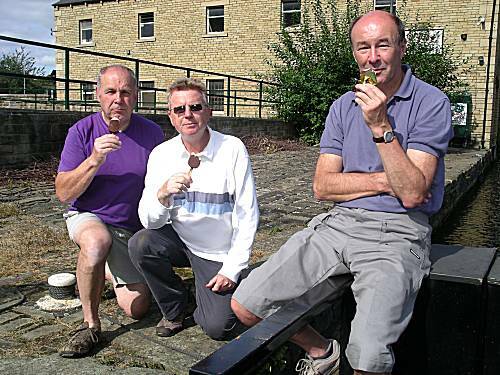 Afterwards they packed their bags, cleaned the narrowboat and awaited collection by Colin, knowing that another dangerous mission had been successfully completed, with the benefit of only 2 pork pies. The crew returned to their loved ones, who welcomed the heroes home. However, the the crew's thoughts had already secretly turned to planning of their next even more incredible and dangerous expedition! !